Cobbles and canals, chocolates and beers, Bruges is one of Belgium’s most touristy cities and was famously lampooned in the film In Bruges, starring Colin Farrell, which highlighted the boredom of staying in the achingly picturesque but not hugely vibrant Flemish city. The film brought even more tourism to the city, according to a local guide. But it is very much a “monoculture tourism”, says the triennial’s co-curator and director of Bruges Museums, Till-Holger Borchert. 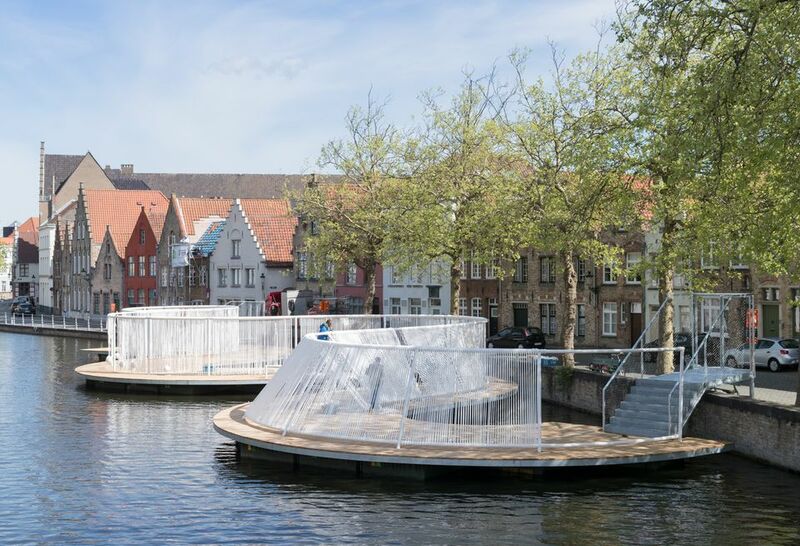 The second edition of the Bruges Triennial (5 May-16 September) looks to build upon the aims of the first, in 2015, by encouraging a different type of visitor to the city and to also make it a “more dynamic place for its inhabitants”, Borchert says. Borchert and his co-curator Michel Dewilde have commissioned architects and artists to create 15 works that are primarily outdoors. It is key that most of the works are “not hidden, [but] shown in public spaces” Dewilde says, unlike, for example, the Venice Biennale, where many are tucked away in the Giardini or Arsenale. The triennial’s programme begins with a literal splash at the floating pavilion designed by the Spanish architectural practice Selgascano, where drinks for the locals and swimming will inaugurate the triennial this weekend. The Selgascano Pavilion is made from a transparent pink-orange plastic skin over a rebar steel skeleton with a pool at the centre where visitors will be able to take a dip in the canal. 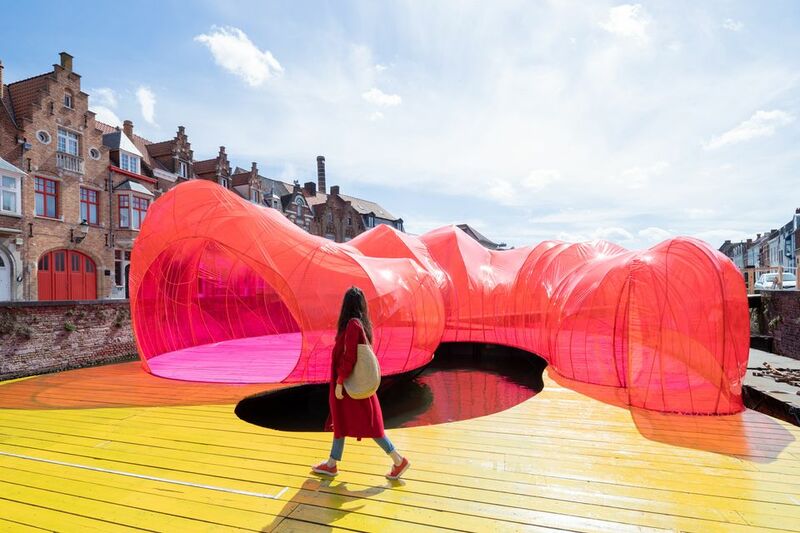 The tunnel-like structure is reminiscent of Selgascano’s 2015 Serpentine Pavilion and the distinctive plastic—sourced in downtown Los Angeles during a recent visit—bathes the interior in a rich light, playing optical illusions as visitors emerge back outside. It also heats up, like a greenhouse, and because this is not the south of Spain people will be able to “feel the sun inside [the structure] if it’s a grey day”, says one half of the architectural duo, José Selgas. The title and theme of this year’s triennial is Liquid City—inspired by Bruges’ waterways and the Polish philosopher Zygmunt Bauman’s description of the current era as a “liquid modernity”—and most commissions are centred around the city’s network of canals. Once working arteries that were vital to Bruges’ economy, today many have been blocked off and are almost exclusively used for tourist boat tours. The South Korean architectural practice OBBA wanted to address the fact that there is now “not much interaction with the canal by the public” and have chosen to “blur the boundary” between the water and the rest of the city with their curved pontoon, says the OBBA co-founder Sojung Lee. The 100 sq. m installation, titled The Floating Island, uses rope to create curtains, swings and hammocks over the water for visitors to rest and play on. Meanwhile, a giant whale made of plastic leaps out of a dead-end canal behind a statue of Bruges’ most famous artist, Jan van Eyck. Skyscraper (the Bruges Whale) by the US architects StudioKCA is made from plastic waste collected from beaches in Hawaii. On the Minnewater lake, in the south of the city, a triangular wooden structure called the MFS III Minne Floating School, by the Netherlands-based Nigerian architect Kunlé Adeyemi, will host local school groups and has been designed as a prototype for an uncertain future of rising sea levels. 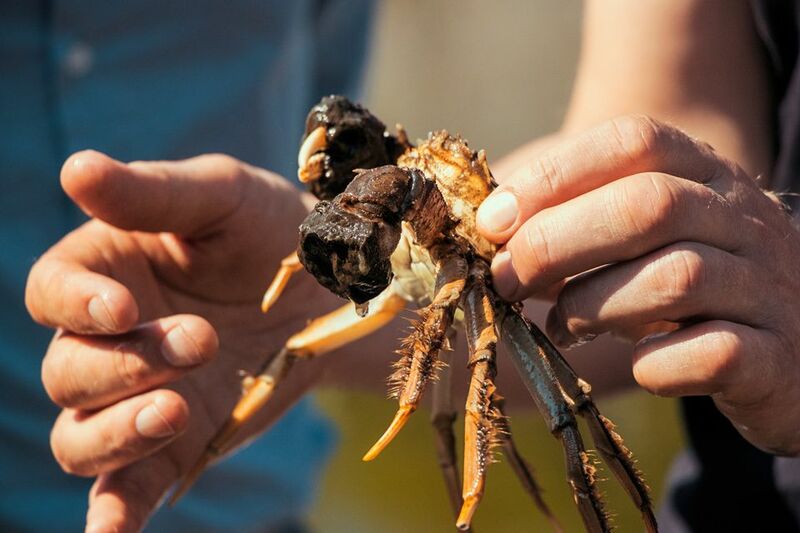 One of the few commissions that is not outdoors is What’s Eating the Chinese Mitten Crab, a research-led exhibition presented by the Brussels-based architecture collective Rotor. The group have looked into the history of the Chinese mitten crab, often seen as an “invasive species” that inhabits the city’s waterways. Although categorised as an outsider, the creature has now been present in European waters for almost a century, says the project manager Lionel Devlieger. The show includes live crabs, boat models, preserved specimens and newspaper clippings from 1939 where the creature was—perhaps deliberately—misattributed as an invasive Japanese crab and called the “yellow menace”. Devlieger says the “stagnation on the discourse of the crab” is somewhat dispiriting and that the nationalistic language used pre-Second World War is “exactly the same” as today’s.